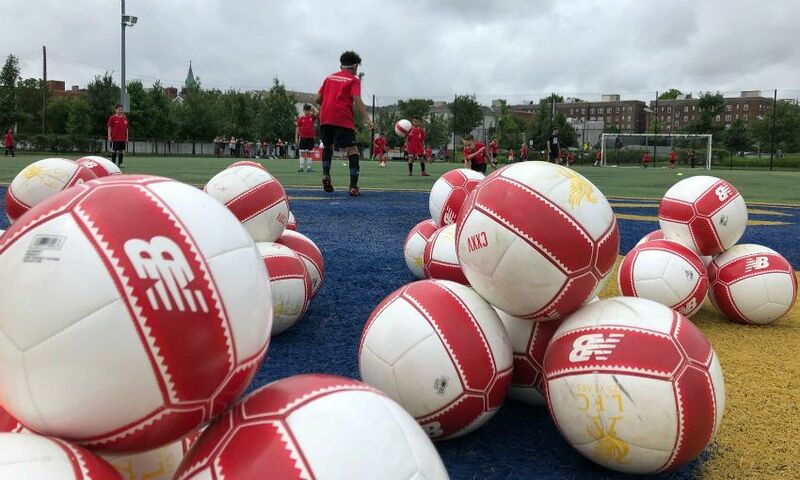 Liverpool FC joined forces with three of its official partners this week to host a series of exclusive soccer clinics for over 150 children as part of the club's pre-season tour of the USA. The first stop saw LFC coaches and community staff head over to OrthoCarolina Sportsplex in Charlotte with the club's Official Family Partner, Joie Baby, which organised the event under its American arm, Nuna, to deliver a unique session to 32 children aged 7-14. The young players from the Eagles Youth Club, a Christian group that aims to transform the lives of young people through football, were challenged to take part in a number of skills and drills activities, followed by a series of fun mini-games. Joie and LFC then made their way to New Jersey before Jürgen Klopp's team faced Manchester City in the International Champions Cup (ICC) to host a soccer clinic at the Essex County Riverfront Park. Thirty-eight children aged 7-14 from Street2Street - an urban youth group that offers sports events, mentoring and personal development - were invited to take part. Standard Chartered, principal club sponsor, was also on hand later in the day to help the LFC coaches deliver two further clinics at Essex County Riverfront Park. Seventy-six children, whose parents are staff members of the bank, were invited to take part in a series of dribbling and keepy-up challenges and speed and agility sessions. The final stop for the community soccer sessions involved the LFC staff visiting the Total Sports Wixom Facility in Michigan, where 32 youngsters from the LFC International Academy in Michigan will engage in a soccer clinic hosted by LFC and New Balance, the club’s Official Kit Supplier. Klopp's side will face Manchester United in their final game of the ICC at the Michigan Stadium in Ann Arbor on Saturday.